MyPlungerPump.com is an information resource for all makes and models of sludge pump style plunger pumps. myplungerpump.com is an information resource about plunger pump technology, a pump commonly used in the primary treatment process to pump waste activated sludge at wastewater treatment facilities. Consulting engineers and distributors have access to information when it is time to install new sludge pump equipment or during a facility upgrade. End users have access to pump maintenance tips and parts information for any make or model of plunger pump. New! The guided stuffing box assembly is a new design to reduce stress on the rotating assembly. Plunger pump brochures for Wastecorp and Sludge Master products and parts schematics for Wastecorp®, Komline-Sanderson® and Carter Pump. Learn about this popular technology for sludge pumping. Get tips on how to service and maintain any make or model of plunger pump. Parts and overhauls for all plunger pump brands since 1946. 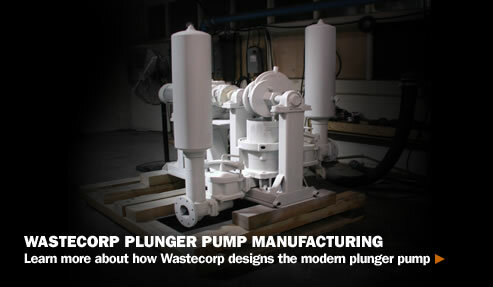 Wstecorp is investing in plunger pump technology. Learn more about it.